U.K. police pull officers watching Assange, vow "covert tactics"
LONDON -- British police on Monday removed a round-the-clock guard from outside the Ecuadorean Embassy hideout of WikiLeaks founder Julian Assange, saying it wasn't "proportionate" to keep up the operation when no end to the three-year stalemate is in sight. 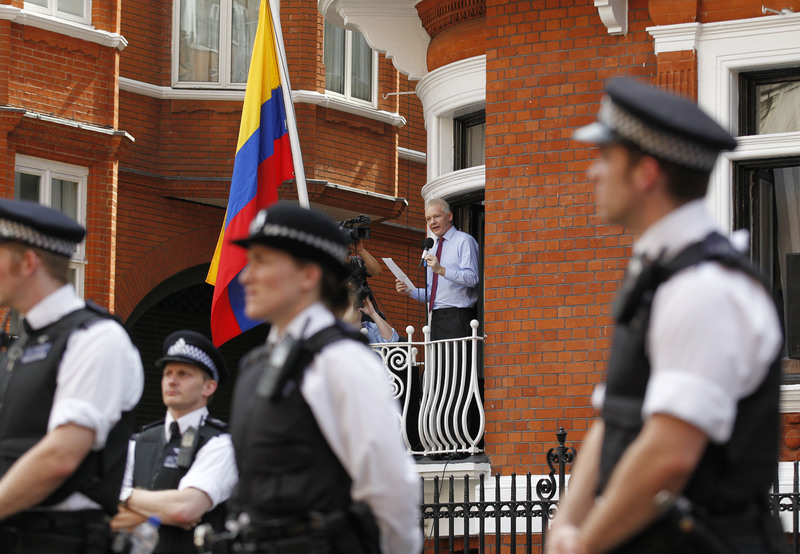 Ecuador has granted Assange political asylum, but he faces arrest if he leaves the embassy. No police were visible outside the upscale Edwardian apartment block that holds the embassy on Monday afternoon - just journalists and a pizza delivery man with a box addressed to Assange. The head of Britain's diplomatic service, Simon McDonald, summoned Ecuador's ambassador to the Foreign Office on Monday to express "deep frustration" at the lack of progress in resolving the standoff. Assange denies all the allegations and believes extradition to Sweden is merely the first step in efforts to bring him to the U.S. over WikiLeaks' secret-spilling activities. WikiLeaks spokesman Kristinn Hrafnsson said removing the police officers did not change Assange's situation. He said Britain "could have resolved this situation a long time ago by giving an absolute guarantee that Julian would not be extradited to the United States." Ecuador's deputy foreign minister, Xavier Lasso, said "substantial advances" had been made toward an agreement with Sweden about questioning Assange inside the embassy. He said a new meeting on the subject would be held in Quito later this month. Lasso called the removal of the police "a coherent step. It's what we've been asking the British to do all along in the face of their complaint that it costs a lot."